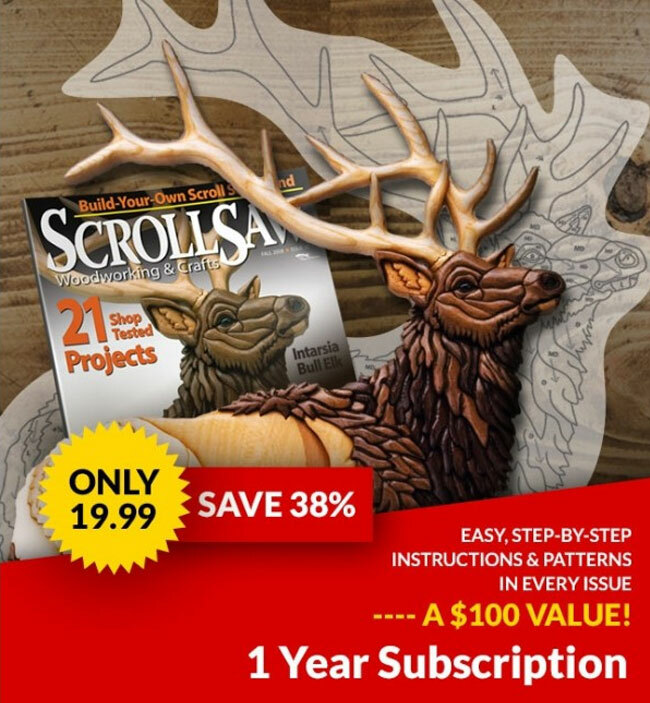 The full article originally appeared in Scroll Saw Woodworking & Crafts Issue #75, Summer 2019. 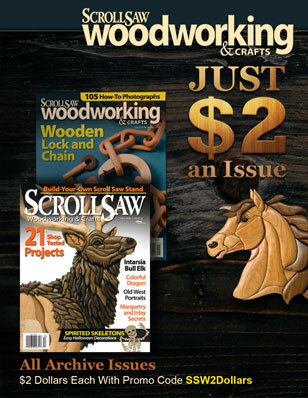 Click HERE to purchase the most recent issue. Layered pieces make impressive wall hangings, but when it comes to displaying this majestic dragon, I like to color outside the lines. 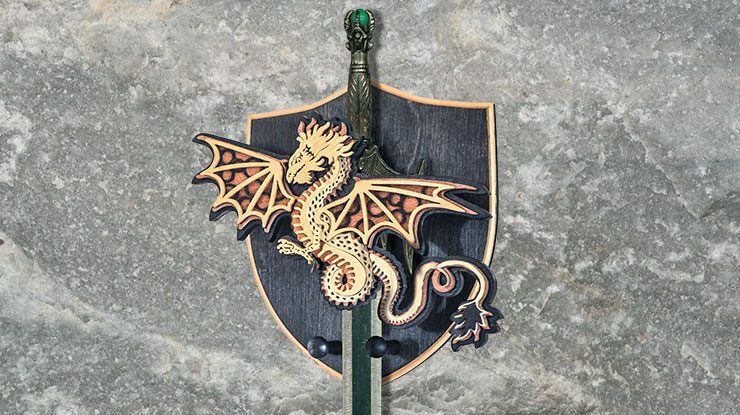 Add it to a custom sword rack or mount it on a shield. 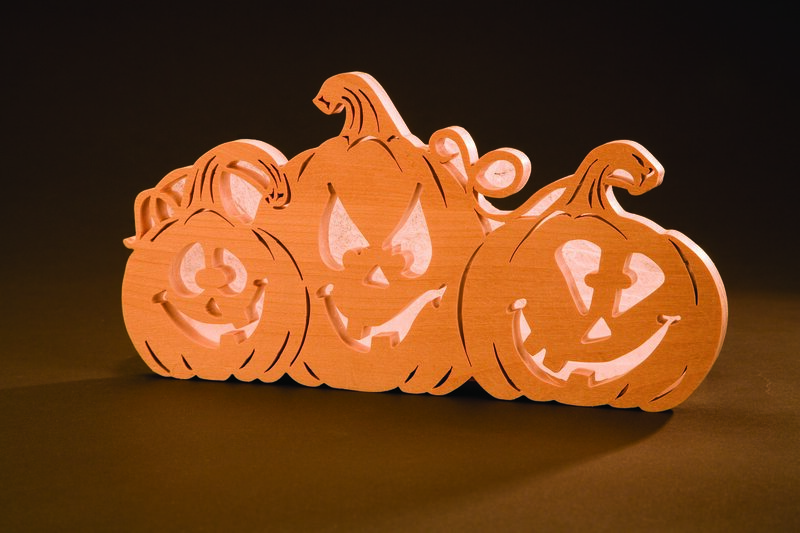 Stack a few sheets of card stock between two pieces of wood to create custom paper art. Assemble the paper dragon, position it on a table, and cover it with a layer of bar-top epoxy for your next big game night. Let this versatile design be a starting point for a stunning conversation piece! This dragon can be a challenge to finish. All the nooks, crannies, and open frets will collect finish, and it can be challenging to get the excess out. One method is to finish before assembling (mask the areas where the layers overlap—these are where you’ll be gluing them together—then finish each layer individually, remove the masking tape, and assemble the project). If you are careful, it’s possible to finish after assembling (assemble the project first, and then apply several light coats of spray finish). The hazard of this method is that it’s impossible to sand away any places where you applied too much finish, so be diligent and careful with your application. A third method is to assemble the dragon, dip it in an oil finish, and suspend it over paper towels upside down so the finish drips down out of the frets. Use compressed air or rubber dental tools to coax stubborn finish puddles out of tight areas. Sue Mey lives in Pretoria, South Africa. To see more of her work, including a wide variety of patterns and pattern-making tutorials available for purchase, visit scrollsawartist.com. She can be contacted at suem@storage.co.za. 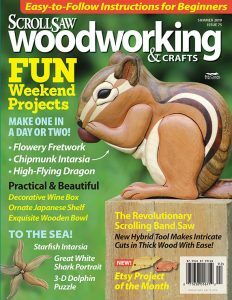 Her pattern book, Lighted Scroll Saw Projects, is available from schifferbooks.com and other outlets. • CLICK HERE to purchase the most recent issue.